HELP!! My clock stopped. How come? 1. The clock is unwound. Most clocks need to be wound once a week. Weight-driven clocks should be wound until the tops of the weights have risen level to the bottom of the dial. Spring-driven clocks should be wound until sudden and substantial resistance is felt. Although it is quite difficult to damage a clock by overwinding, care should be taken to avoid forcing a few extra "clicks" of the winding ratchets. When in doubt, underwind! balance. A clock should produce an even "tick - tock" sound as the pendulum swings or it will stop. A clock that sounds "tick - TOCK" or "TICK - tock" is out of balance or, as clock people say, "out of beat." Out-of-beat wall clocks can be adjusted by carefully and gently sliding the bottom of the clock to the left or right until the ticking sounds even out. If the clock looks crooked when it sounds correct, professional adjustment is needed. Out-of-beat shelf or mantle clocks can be put right by sliding thin strips of cardboard or a similar substance under the legs of one side of the clock or the other, experimenting with which way, and by how much, the correction must be made. Here again, if excessive correction is required, professional assistance should be sought. The most frequent cause of clocks becoming suddenly out-of-beat is inattentive moving. This often accompanies housekeeping, wall painting, redecorating or relocating. ALWAYS remove the pendulum from a clock when moving it!! 3. The clock is not stable. A clock may wobble if it is hanging on an uneven wall or sitting on an uneven surface. If you can make the clock wobble with slight pressure, you must insert something to prevent the movement. Hardware stores sell various small cushioning products with adhesive backing that suit the purpose very well. Or you can use cardboard, matchbooks, etc. 4. The clock needs cleaning and maintenance. If an eight-day clock begins to run for only a few days, it is time for professional attention. The probable causes are drying out of the lubricant, grit on the gears and shafts, and parts that are worn from years of normal use. Most clocks that are properly serviced can run for ten years. 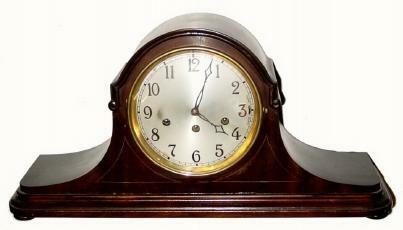 I have repaired clocks that have run properly for more than thirty years thereafter!